Heat Reflect is a bright, mid-weight heat reducing synthetic turf specifically designed to stand up to hot climates. This new PolyTurf product is available in a vibrant green color with a natural-looking green and sand-colored thatch. PolyTurf Heat Reflect features Platinum HeatMaxx technology which warrants the turf against reflective burns, making it especially practical in areas with reflection from windows and other surfaces that can concentrate the sun's rays. 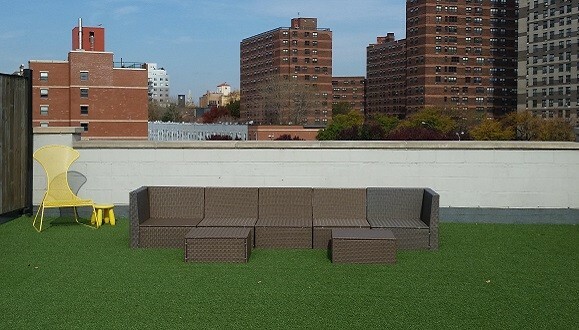 This product is a great synthetic turf for rooftops where direct sunlight and reflections from windows can be a concern. 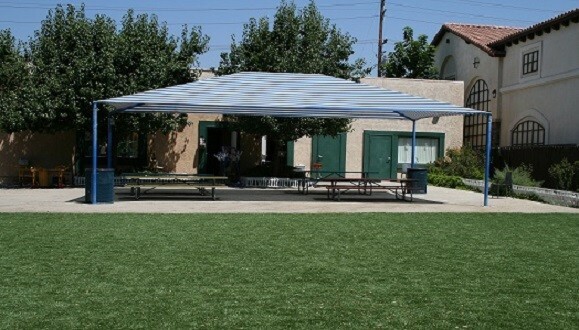 Since Heat Reflect is made from nylon, this synthetic turf is not only more durable than polyethylene products, but it also stays up to 15-20 percent cooler. Heat Reflect also features a BioCel soy-based backing which makes this synthetic turf a more environmentally friendly option. As always, our products are non-infill, attractive, long lasting, and economic.